Day 2: Wednesday 8 August at AJ Kelly Park, Kippa Ring (Redcliffe). Bill Turner Trophy (Girls) Final: Kelvin Grove State College 2 (Holly Cawthorn 41m, Sofia Jaramillo 80m GG) beat Helensvale State High 1 (Lily Rae 2m). Bill Turner Cup (Boys) Final: Toowoomba Grammar School 2 (Henry Wells 28m, Dylan Proctor 73m Golden Goal Penalty) beat Palm Beach-Currumbin State High 1 (Lachlan Anderson 23m). Trophy Third Place Play-off: Chancellor State College 3 (Lanni McDougall 8m, own goal 56m, Tia Vela 59m) drew with Cairns State High 3 (Skye Newman 13m, Daly Collis 26m, Tara Knight 47m). Kelvin Grove State College and Toowoomba Grammar School progress to the National Finals Series to be played at Lake Macquarie Regional Regional Football Facility, Park Street, SPEERS POINT NSW 2284, in September (4&5). 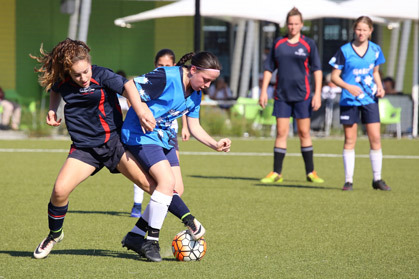 S/F 1: Kelvin Grove State College 2 (Sofia Jaramillo 14minute, 45m) 5 penalties beat Chancellor State College 2 (Mackenzie Brown 38minute, Lanni McDougall 43m) 3 pens. S/F 2: Helensvale State High 3 (Lilly Rae 49m, 54m, Jasmine Hewitson 76m [Golden Goal]) beat Cairns State High 2 (Aleeh Davern 25minute, Daly Collis 37m). S/F 1: Toowoomba Grammar School 2 (Henry Wells 17minute, 24m) beat Kawana Waters State College 1 (Nick Harvey 44m). S/F 2: Palm Beach Currumbin State College 2 (Richard Prosdossimi Dos Santos 18minute, Elijah Hughes 32m) beat St Stephen’s Catholic College (Mareeba) 1 (Liam Haendel 4m).